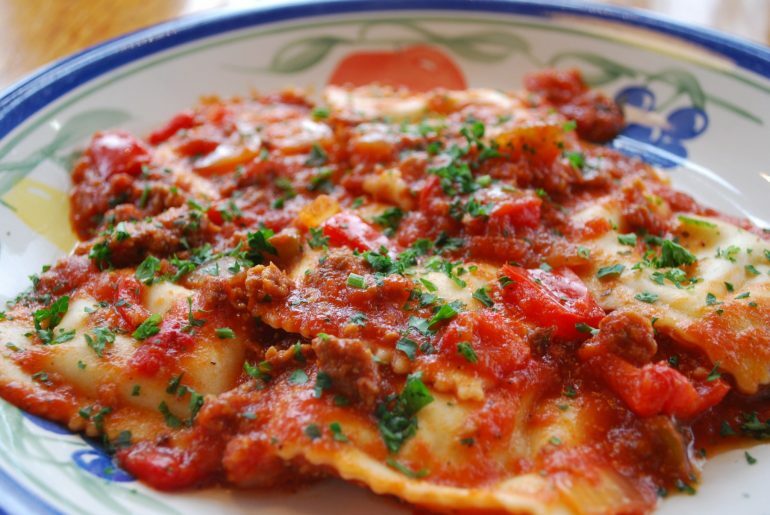 I can just about taste the pomodora sauce when I look at this photo of ravioli from Figo. Sandro Romagnoli is a man of passion. It’s not surprising considering he is Italian. But it’s lucky for us that his passion involves food, which led him to open Figo Pasta. And his goal? To make people happy. Sandro had been an international sales manager before he opened the first location of Figo on Collier Road. At first he only had a take-out window, then slowly expanded to table service. I heard about Figo when it first opened and as it’s about three minutes from my house, went to check it out. I loved it and wrote about it in a restaurant newspaper column. Sandro told me last night, with true Italian emotion, that I was the first person to ever write about it. But let’s talk about the food. Everything is fresh, fresh, fresh – and except for desserts, all the food is made right on the premises. You can select from a few classics such as lasagna or my usual, zucca, a rich butternut squash ravioli. Or you can pretty much create any type of pasta you want by choosing your type of pasta and then the sauce. 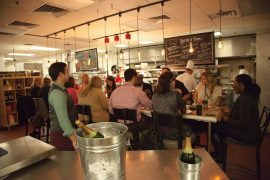 With 25 types of pastas and 18 sauces, there are – well, I don’t want to do any math to figure out exactly how many possible combinations there are, but you’d have to go back to Figo every week for years to taste them all. Which actually isn’t a bad idea. Last night I tasted a few items I hadn’t had before. I loved the paninis, and Figo has five types of those, and the lightly fried sea bass that can be added to a salad, was delicious. But my favorite was the Ravioli di Cipolla, carmalized Vidalia onions with mascarpone ravioli with a balsamic glaze. 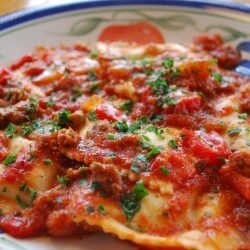 Sandro told us that he added the onion ravioli because the symbol of his hometown in Italy was the onion, which had been a subject of ridicule for neighboring towns. Nothing like revenge of the delicious edible variety. Also new at Figo is a bambini menu, for kids 10 and under, for only $3.95. “I didn’t know anything about feeding kids. But then I had Dante, and now I know,” he said pointing to his adorable two year old. 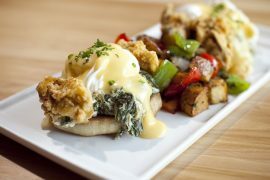 Figo serves fresh, delicious, simple and affordable food. I’d say Sandro has met his goal – he makes people happy. And I’m fairly certain his mamma is happy too. Sandro has another passion and asked me to share it with you. It’s the Child Protection Center at Children’s Healthcare of Atlanta. The Center is doing vital work as it advocates for child abuse and neglect in Georgia.